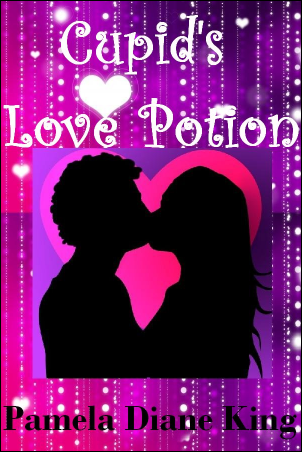 Editor's Note: This is chapter 1 of Pamela's middle-grade novel Cupid's Love Potion. Chapter 2 will appear in next month's issue. The complete novel may be purchased at Pamela's website: pameladianeking.com. My heart beat faster as I admired his golden tan. His crystal blue eyes locked onto mine and a thrill took over my whole body. I closed my eyes, ready for his kiss. "Phoebe, what are you doing?" my best friend Liz demanded, snapping me out of my daze. "I'm in love," I said dreamily dropping the magazine I was about to kiss. "Oh boy, here we go." She sighed, and started nibbling her whole wheat salad sandwich. "This is a serious matter Liz, a matter of love and death," I said loudly. She looked up from her sandwich. "Um, don't you mean life and death?" "Love, life - same thing," I said quickly, grabbing her free hand with both of mine. She jumped. "Phoebe, you know how I feel about sudden movements." I smiled at her knowing I had scared her again with my wild surges of energy. "Chase, my future husband, is the most gorgeous, sweetest guy in the whole world. Just the sound of his voice makes my heart want to burst. It's like we've known each other our whole lives. I feel such a strong connection with him, like I can see his soul. In fact, I think he is my soulmate." Liz stifled a laugh, and extracted her hand from mine. "Your soulmate, I don't believe in that." She adjusted her frameless glasses. "I read a newspaper article that gave scientific evidence proving that we can have many so-called 'soulmates.'" "Liz, please don't ruin my fantasy with scientific talk. This is not about data or research. This is about dreams. I'm allowed to dream, aren't I?" I shook my head at her "I Love Chemistry" T-shirt that was a free gift with her favorite magazine of the same name. "Yes, of course you are." "You're the only person I can talk to about this stuff," I said in my baby voice, trying to make her feel guilty. "I'll listen as much as you want me to," Liz reassured. I smiled, satisfied that I had her full attention for as long as I wanted to ramble on. "Sometimes, I lie on my bed and think about Chase for hours. I picture his dazzling smile that makes my heart flutter. He has the best teeth I've ever seen, so white and straight, he could definitely be in toothpaste commercials. I also imagine us going on dates together where we hold hands, make sand castles on the beach, and have picnics by the lake." "It sounds like a Disney movie montage. You know what I think about Disney movies." "That's putting it lightly. But Phoebe, how can you be in love with someone you've never met?" Liz asked rationally. "It's like we met in another life." I said mysteriously, gazing out the window at the clear blue sky above the distant sea. I frowned. I missed being able to swim in the ocean, because the water was too cold in February. Liz rolled her eyes. "So now you believe in reincarnation?" "No, but love shows you a whole new world." "Please don't start singing that song from Aladdin," she joked. "Don't tempt me." I shook my finger at her, and we both smiled. "But it's true what they say, Liz. The sky looks bluer and the grass looks greener when you're in love." She rolled her eyes. "But Phoebes, boy bands are like cabs, a new one comes along every minute." She gestured to invisible cabs driving through the cafeteria. I scowled at her. "They aren't a 'boy band.' They don't dance around like 'N Sync, they play their own instruments, and write their own songs. There is a difference." I folded my arms across my chest defensively. "But they are boys, who are in a band." "Why do you always have to be so logical?" "It's a gift." She beamed and took a sip of her carrot juice. "Chase and his brothers, Nick and Jamie, are very talented, especially to have achieved what they have as teenagers. Carson has had five number one hits, and they won Best New Artist at this year's Teen Choice Awards. They are the most popular teen band around, and girls go crazy for them like they're the Beatles. You know that I own all of their CDs, well, both of them, and I asked my mom to buy me their concert DVD for my 14th birthday yesterday. I've already watched it three times." I rolled my eyes. "You sound like my mom. There are more important things in life than homework." "What she doesn't know won't hurt her." That had always been my motto to get away with things with my mom. 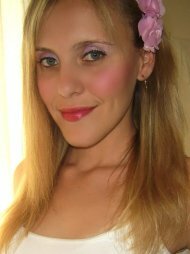 "My favorite video is for their song called 'Summer of Love.' Have you seen it?" "No, but I've heard the song. It's very corny." "It's not corny, it's romantic. The video takes place on a secluded beach at sunset, with the three brothers walking in the water and singing. They're all wearing white, and Chase looks like an angel. I like to pause on shots of him. A lot of their videos are filmed in slow motion to create a more romantic feeling, and it definitely works." She did her best impression of my mom. "Phoebe Parker, if you spent as much time on your schoolwork as you do worrying about Chase, then you would be in college." "But Mom, Chase is so much more interesting than school," I whined. We both giggled. "Speaking of Aladdin, I want a genie who could grant me a wish. I would wish to magically appear in a video with Chase, or that he would magically appear in my bedroom." Liz coughed on her carrot juice. "Your mom would definitely freak out if Chase or any guy was in your room." I nodded. "My mom is so uptight." "Well, I think my Mom would freak out too." I opened Teen Idol Magazine and flipped through the pages until I found the page with pictures of Carson filming a music video. "Look at this," I said, holding the magazine up. "They're filming a music video and look at these skanky looking girls. I don't like the scenes in their videos where they have the 'love interests,'" I pouted. "Are those the girls in bikinis prancing, I mean dancing, around in their videos?" "Yes, they're girls that the brothers have to act like they're in love with. They're always beautiful models who are really bad actresses. I can tell that Chase is uncomfortable when he has to act those scenes. He is more concerned with his artistic vision than flirting with every girl who throws herself at him." I pushed the macaroni and cheese around my plate. "Sure he is," Liz mumbled under her breath. "Aren't you going to eat today?" She eyed my full plate critically. "Love is all the food I need." She put her face in her hands. "Phoebe, you can't survive on love alone." Her expression softened. "But when people are in that infatuation phase, they often can't eat and can't sleep." "Love is a delicious torture. There's just one tiny problem with being in love with a teen idol," I said. "I think I can guess what that is." "A million other girls feel the same way as me." "I was waiting for you to realize that." "But they just have crushes on Chase. I know that my love is real." "That explains it," she said sarcastically. "Not that I blame them. I mean, what girl wouldn't have a crush on him? He has everything a girl could possibly want. He has the most stunning sea blue eyes that I love to gaze into. He looks like a surfer with his golden tanned skin and sandy blond hair. The back and sides of his hair are shorter, and the slightly longer front is always flicked up with just a hint of gel or mouse. He's not too tall, but not too short, about 5 feet 8, and still growing. He has a beautiful face, and is often called a 'pretty boy' in magazines." Liz grinned. "He does look rather feminine. He must spend hours on his hair," she said, examining the pictures of Chase. "But it pays off. You can't deny that," I pointed out. "Well, if you like guys who look like girls," she said, winking at me. "I resent that. Chase is a metrosexual," I said, shoving the magazine cover in her face, as though I was his defense attorney. Liz raised her right eyebrow. "I'm scared to ask, but what is that?" "A metrosexual is a guy who puts a lot of effort into his appearance. They shower at least twice a day, only wear the best clothes, and make sure that their hair always looks great. Like Zac Efron. Have you seen his hair? A normal guy can't do that with his hair." "I bet Zac Efron spends more time on his hair than a girl," she said chuckling. "Laugh all you want, but I'd rather a guy put in too much effort with his hygiene and appearance, than no effort at all. Take the majority of the guys here." We glanced around at the tables in the cafeteria, mostly grouped by male and female. "It looks like they just fell out of bed in the morning, and came to school wearing the T-shirts they'd slept in, and covered their greasy hair with caps." I gestured with my fork to a group of guys who were having a burping contest to demonstrate my point. "I think you're right." Liz said grimacing, and wrinkled her nose like she could smell them. "Chase is like no other guy. He's so sensitive. You can hear it in his voice when he sings. He's really in touch with his feelings." "Carson's songs sound like the poetry of any other hormonal teenage boy to me. How old is Chase?" "Chase is the middle brother. He's 15, a year older than us. I like that he's a year older because guys our age are so immature. Apparently, girls are two years more mature than guys their age." "Is that physically or emotionally?" "I don't know, I think both. Look at Ben, he's our age and he's immature. Well, emotionally at least. Physically he's about as tall as Chase." "Ben is not immature. He likes to make people laugh. Besides, he is our best friend, so you shouldn't call him immature." "He always acts silly. I prefer people to laugh with me, rather than at me." "He wants to be an actor," Liz pointed out. "Where is he anyway?" "He's painting sets for the Theatre Club. But you have to agree that he is the class clown." "I guess you could say that," Liz admitted hesitantly. Ben was like the brother I never had. He had always been the most important guy in my life, until Chase came along. "I know that Ben is a sweet guy. He's always so helpful, offering to carry my books to class, and holding doors open for me. I like that he's a gentleman. But Chase is the best guy ever, much better than any guy at our school, or any school." "There goes the bell for the end of lunch." Liz quickly gathered her things. She was never late for anything. Chase's blue eyes watched me as I picked up my books. "Somehow you will be mine," I whispered to his picture, and hurried to catch up with Liz. "I hate P.E. with a passion," I moaned. "Join the club," Liz mumbled. "I think we're 'sports challenged.'" "Hey, I resent that," Liz protested, nudging me. "But whatever ball sport we play, we always end up dropping the ball, if we even catch it." "I can't deny that," Liz admitted, sitting down on the stand beside me. Our coach, Miss Jackson, was making us play basketball. We always had too many players, because the guys and girls played together. Liz and I were among those who had volunteered to sit in the stands and cheer for the players. I had never gotten the hang of dribbling and running at the same time, so I always chose to sit out rather than embarrass and/or hurt myself. "I like watching Ben play, even though he's no Michael Jordan. I mean, he's not bad at sports, but he's not the best." "Yeah, he's more into the arts." Ben kept looking over at us every five seconds, and we waved at him and gave him the thumbs up, like he was an LA Lakers player. "Liz, I know that I'm not the only one with feelings for Chase. But I know that if he knew me, just got to meet me even once, he would fall in love with me." "It's possible," she said, not taking her eyes off the game. "Take that band Hanson, for example." "They were the Carson of the Nineties. Hanson was also made up of three teenage brothers. Every single one of them met their wives at their concerts. The girls were fans in the crowd! So there's hope for me." "Wow, I didn't think that really happened," Liz said surprised. "Maybe I've been too cynical." "I'm glad you've seen the light," I said satisfied. "I've literally dreamt about how it would happen. In the dream I went to a Carson concert. I made my way through the crowd of girls going nuts, slowly moving towards him as if there was a magnetic attraction between us. It only took about a minute, but felt like hours because everything happened in slow motion, just like in his music videos. I walked through the haze of smoke until I was at the front of the crowd by the stage. Chase looked down and focused right on me. He couldn't take his eyes off me. He smiled at me, and my heart raced. He sang the rest of the song to me. Then, just as he reached his hand out to invite me onstage and dedicate a song to me - I woke up." "I only dream about everyday stuff, like going to school. Once, I dreamt that I had to write an exam on a country that doesn't exist, and I hadn't studied." I laughed. "That's typical of you to dream about school." "It was such a horrible dream. It was more like a nightmare. When I woke up, I was drenched in sweat. Gross." "The nightmare of the girl who didn't study," I said, putting on my deep announcer voice. Liz pushed me gently. "Speaking of sweat, I'm sweating like a pig, and I'm not even playing." "It's these polyester outfits." I pulled a face at the shapeless blue and yellow P.E. outfits. "It's been nice weather for February." "That's California for you, we sweat even in February." "Don't you think it's cool that we live in Orange County? The show I watched religiously called The O.C. made this place famous." "Never heard if it," Liz said casually. "Are you sure you're not a 40-year-old trapped in a 14-year-old body?" I joked. "Huh?" Liz shot me a confused look. "You know, like those movies where teenagers switch bodies with their parents. Are you in there, Mrs. Fraser?" I whispered. We both laughed. "Look, Ben just scored a point." We shouted his name and clapped loudly. He glanced at us, and turned a bright shade of red. "Anyway, can we get back to Chase please?" "Does it matter what I say?" she asked playfully. "Not really," I joked. "I can't wait to see him perform live, in person. If he could just meet me in person, then he'd realize that we're meant to be together. When I listen to him sing, I feel like he wrote those words for me, and is singing to me. Even though he has never met me, I feel like he knows I'm out there, and he's waiting for me. I believe that my dreams will come true, because the Law of Attraction says that what you think about and desire becomes reality. You create your own reality." Liz sat up straight. "Now, that I do believe. It has been scientifically proven that the energy we put out, we attract. The world is made up of energy, and our thoughts are just energy. Our thoughts actually determine our reality." "My thoughts are all about Chase, so I should be attracting him to me as we speak," I said gleefully. "Oh no, look!" Liz exclaimed. I jumped. "What?" I asked, following her gaze to the basketball court. Ben was lying on the ground in the middle of the court, surrounded by a crowd. "Ben!" I shouted automatically. We both ran over to where he lay, and knelt beside him. I panicked when I saw his eyes closed. "Ben, are you ok?" I could hear the alarm in my voice. I wiped his wet hair off his forehead. "Ben, if you can hear me wiggle your toes." He opened his brown eyes and looked right in my mine. "I'm fine," he sounded like he had been punched in the stomach. I helped him sit up slowly. "I'm not in a coma." "I'm so happy you're alive!" I gushed, throwing my arms around his neck. "Hey, relax. You can't get rid of me that easily." He smiled weakly. "Sorry," I said, releasing my vice grip around his neck, and giving him some room to breathe. "Ok, everyone go get changed." Miss Jackson shouted. "Ben, let's get you to the nurse." "I'll take him," I offered quickly. Ben looked at me. I made him put his arm around my shoulders. "Thanks," he said as he limped to the nurse, whose office was luckily close by. "No problem. You're always the one helping me. Let me help you for a change. You're my best friend Benji." "You're the only person I'll let call me that," he laughed weakly.